Boracay is home to a large number of resorts and hotels throughout the entire island and from coast to coast. Each of these accommodation options differs from the next with some offering family friendly amenities and rooms, wind surfing options, swimming pools, wellness activities such as yoga, a beachfront location, closeness to in-town activities and nightlife and some even the choice to relax in a top notch spa with various treatment and massage options to pick from. Each spa is increasingly different from the next, making for a large amount of spas to choose from. Some visitors prefer a plethora of spa treatments to select from while others simply wish for a traditional massage before dinner. 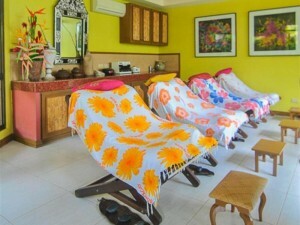 Either way, there are lots of resorts scattered throughout the island of Boracay that offer some sort of spa amenity, whether it be a full blown spa or massage tents near a pool. Each of the resorts listed below offer great spa services, whether indoor or outside and are rated highly with happy guests and great reviews. 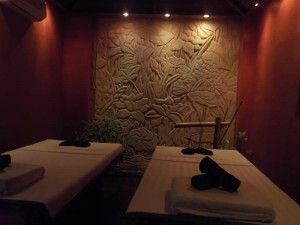 Perhaps one of the more popular features of a resort, a spa is a great way to disconnect, relax and sooth achy muscles after a day exploring or enjoying a few water sports. But because spas are so popular and sought after, more and more resorts and hotels are offering massages and treatments as a part of a guests stay either as an inclusion in the nightly rate or as a fee based amenity. Due to the large amount of resorts within Boracay offering some sort of spa for their guests, we’ve put together a list of the best of the best, helping to take hours out of your personal research time. A 5-star beachfront resort that attracts visitors back time and time again, the Ambassador in Paradise resort is medium in size, offers top notch services and is close to shopping, restaurants and activities in town. 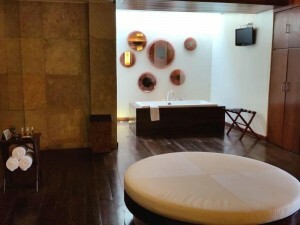 Each of the 50 rooms provide guests with free Wi-Fi, a flatscreen TV, bath amenities and a private balcony. Adding to the resort’s attractiveness is the gourmet all day dining restaurant specializing in wood-fire pizza. Other amenities include a swimming pool, jacuzzi, free shuttle around the island, a 24 hour butler service for each and every resort guest and various water sports to enjoy. 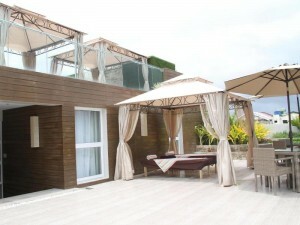 Instead of offering a closed in area for massages, the resort provides massages tents situated near the pool area. This helps to get an airy, nature-like feel, helping to add to the relaxing experience. Reviews are all generally the same with each praising the resort for its service, large rooms and amenities. Guests also love the location adding that the quietness of the area helps to bring out a romantic and peaceful vacation vibe. Featuring 20 large, private villas, Asya Premier Suites is located on a quiet, secluded beach near the southern region of Boracay and is a truly luxurious choice. Here guests will find a long list of features and amenities including spa and salon services, a restaurant, a bar, on call nanny services, a 24 hour on call doctor, a fitness room and an infinity pool. Those traveling with children will not only find the nanny services to be helpful but also the various board games, toys and books available. Ocean lovers will find fun in the water with kayaking and snorkeling as well as easy land movement with golf carts. All together there are only 20 rooms in 2 different categories but each of the rooms are filled with luxury amenities, helping to give this hotel a 4-star rating. Each room features a mini bar, free Wi-Fi, free bottled water, a TV, desk, daily newspaper to enjoy, a cushy oversized bed, different air conditioners throughout the suites, a standalone bathtub and separate shower and a spacious private veranda. The rooms are also accented and decorated with wood and rattan furniture, helping to keep in tone with a rich island theme. Some of the best reviews found on the island praise this hotel for its service, rooms and location with many feeling that Asya Premier Suites is the best hotel for honeymooners and other romantically inclined individuals. 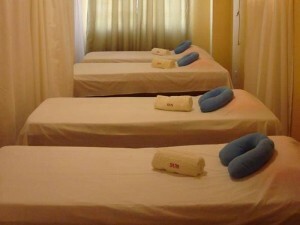 Slightly different from most other resorts and hotels in this list, instead of just having a spa on-site, the Best Western Boracay Tropics Resort offers in-room massages that are very popular with guests. 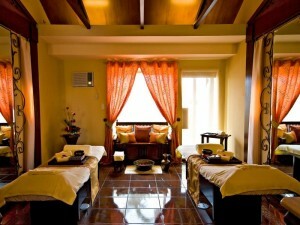 The spa on-site also offers massages, treatments and surprisingly, a nail salon. The resort provides a souvenir shop, function room, travel planning, medical assistance and is family friendly with a kids playroom. Guests can also add to their stay with swimming and snorkeling opportunities. There are 64 rooms in total, each with a mix of Asian and Mediterranean decor, air conditioning, both hot and cold water, a rain shower, a mini bar and cable TV. With a great nightly rate, both the appointment of an on-site spa and in-room massages, outdoor activities, a restaurant and bar and comfortable, clean rooms, it’s easy to see why this resort is one of the most stayed at resorts in all of Boracay. With a low nightly rate, the Boracay Mandarin Island Hotel is a great choice for budget minded travelers looking for a clean, comfortable stay close to the action of the city. 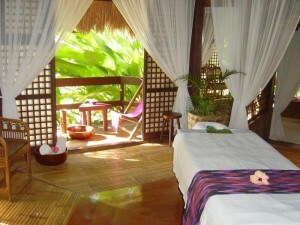 In fact, a short walk is all it takes to reach great restaurants, shops and the famously known Boracay nightlife. There’s also an Italian restaurant on-site that’s highly regarded, a swimming pool and a kids swimming pool. For those who are planning a long stay, the hotel’s laundry service will prove useful. In addition to the other hotel amenities, the most well loved is the Mandarin Spa which offers a range of treatments and is considered one of the best wellness providers in the Philippines. Being a medium sized hotel, there are all together 52 rooms to choose from in 9 styles including a few with a sea view and others that are poolside. Each of the room types, though different in look and location, offer air conditioning, plush comforters, internet access and cable TV. For those who are looking for a homely vibe, there’s a coffee and tea making area, a refrigerator and a mini bar. Reviews are good and cite the closeness to activities, good food and clean rooms. A rather large resort with almost 300 rooms on-site, the Boracay Recency Beach Resort is a highly regarded 5-star resort that caters to many types of travelers with affordable rates. Even families find comfort here with kid friendly menu options, a beach and a few pools. Due to the large number of rooms, guests will find that there’s an impressive amount of room categories, including a honeymoon suite. Whichever room is chosen, each comes with a balcony that either looks over the pool or garden (with the exception of the superior rooms), a coffee and tea making facility, a TV with multiple cable channels to choose from, air conditioning that can be individually controlled and either 2 single or 1 queen sized bed covered with 300 thread count duvet covers. The resort itself is located right in the heart of it all with easy access to shops, dining options and attractions. But for those who rather spend more time in the resort than outside, guests will find 6 different restaurants, a beach, fitness center, several swimming pools, a mini shop, laundry service, Wi-Fi access, and a VIP lounge. Visitors who love to enjoy a few hours of peace will find that even a resort full of kids won’t be able to stop the Kai Regency Spa from delivering a day full of massages and treatments in a calm, private area.Those who are expecting a super luxurious resort may be disappointed as this resort, though beautiful and full of amenities, it is slightly more on the homely side than classic. With that said reviews are high with many expecting to return for a second stay, which says a lot. Affordably priced, the Boracay Uptown Hotel is a small to medium sized resort featuring 28 rooms along with a number of resort amenities. Within each room, though there are a few different room types on the property, guests will find themselves privy to free internet in Wi-Fi form, 2 queen size beds, a minibar and a 32″ LCD cable TV. Guests will also find both hot and cold water for showers, a bathrobe and telephone. The hotel allows guests to enjoy a variety of amenities including a spa with numerous treatment options, babysitting, golf access, beach soccer on the private beach, a family room, an infinity pool that faces both the beach and ocean and the fun game of water gladiator. The hotel also operates a 24-hour front desk and a concierge, allowing for helpful insight into area attractions and adventures. Through there are restaurants nearby, the hotel offers its guests 3 different dining options to choose from with each offering something a little different. A large amount of positive reviews helps to make this hotel one of the better options for those looking for accommodation options in the middle price range. A high ranking 5-star resort, Discovery Shores Boracay is a symbol of excellence with reviews to back it up. Here guests will find 88 rooms within 5 categories, including some suites featuring 2 bedrooms. Regardless of the room size, each of the rooms include a minibar, a tea and coffee making area, a 32″ LCD TV and little extras like down pillows and oversized towels made of 100% cotton. The resort also presents several different bars and restaurants to choose from, including one situated next to the resort pool. Outside of the restaurants, guests will find a large amount of on-site amenities including a pool, library, gym, a kids room titled The Sandbox, a CD/DVD library, daily local newspapers, a laundry service and available medical help. There’s also a spa on-site offering a variety of massage choices. Reviews are strong with many loving how kid friendly the resort is, how convenient the location is and how valuable the extra amenities are. There are also others stating that they will likely return for a second stay, making the higher nightly rates well worth it. An inland situated 12 villa resort, the Mandala Villas and Spa is a great choice for those seeking pampering, peace and quiet. Located a mere 10 minute walk away from the beach, guests will find 4-star accommodations that allow for a quieter vacation while still being able to ease into the bustling part of Boracay. In each of the large rooms, guests will find a plethora of features and amenities ranging from remote controlled air conditioning, a personal refrigerator and mini bar, a free standing bathtub, a 42″ TV that is available upon request and a private outdoor lounge area. Little extras come in the form of a weighing scale, iPod deck, robe, slippers and an umbrella proving that this resort really does think of everything. Adding to the level of comfort is a spa, yoga classes, a sauna, garden, free laundry service, a restaurant and more. Spa lovers will find 10% off of all spa services and a free daily Mandala Qi Massage for one a lovely and thoughtful extra. Great reviews help to justify the nightly rate by detailing how large the villas area, how qualified the spa is and how the little things really do add up to make an incredibly serene vacation. A large 5-star resort situated on the northern tip of the island, helping to create a secluded vacation, Shangri-la’s Boracay Resort and Spa offers 219 rooms to choose from with some being suites and villas as well as a nice list of amenities inside and outside of each room. Each of the rooms are built to impress with a mini bar, writing desk, a coffee making center, a flat screen TV, a marble floor bathroom with 2 sinks, a separate rain shower and bath and a private veranda outfitted with a daybed where guests can take in the views of the ocean or the resort’s plush gardens. Keeping up with luxury standards, each room also comes with a few extras including an iPod dock, free internet, premium toiletries and elegant stationery. Outside of the resort’s many rooms are 6 different restaurants and bars to enjoy, a few beaches to relax at, a free-form swimming pool, adventure zone, dive center and a whole host of outdoor activities including parasailing, wind surfing, snorkeling, kayaking and jet skiing. Those who love to fish will find deep sea fishing charters available as well. It is easy to see that this particular resort was made for the adventurous type. However, it’s also built for those who like to take some time out of their day to relax. The CHI spa is located overlooking the private bay, offering a peaceful and beautiful sanctuary for massages and treatments. With some of the best reviews on the entire island, it’s easy to see why visitors flock to this impressive resort. Even the high nightly rates can’t seem to keep guests away. A beachfront location with a small number of rooms, 16 in total, the Surfside Boracay Resort & Spa is a 3-star resort offering a few surprising extras. Within the resort guests will find a coffee shop with a selection of Japanese, eastern Asian and Western tastes and a dive shop. 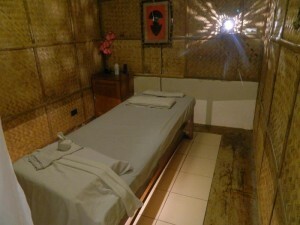 There’s also a wonderful small spa on-site that offers a rather nice sized selection of treatments and massages to enjoy. Due to the resort’s location on the beach, yet slightly removed from the main hustle and bustle beach section, guests will be able to enjoy all of the activities offered in the area without having to deal with all the associated noise and crowds. In each of the 16 rooms available, guests will find a mini bar, air conditioning, cable TV, both hot and cold water for showers and a veranda, helping to increase the overall size of the room. Reviews are very positive with most guests praising the large size of the rooms, the closeness to the city’s attractions and the great service provided. The low nightly rates help to make this resort a great, cozy selection that’s affordable for budget minded travelers. A mere few minutes away from everything the city center has to offer, The Sun Villa Resort and Spa Beachfront is a great choice for those looking to stay at a smaller resort that’s close to numerous attractions and activities. Guests will also find themselves close to the famous D’Mall, making it easy to pick up some trinkets and souvenirs for yourself as well family and friends back at home. The resort itself is located directly on the beach, making for a great, and cheap beach stay without having to be far removed from the happenings of the city. 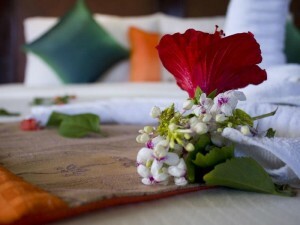 Within the resort, there are 18 rooms in total with 4 different room categories including one designed for families. However, no matter the room category, each room is complete with air conditioning, a mini bar, private bathroom, free internet, a cable TV and both hot and cold water for showers. 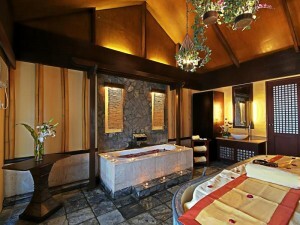 Outside of the rooms, the resort is host to a restaurant and spa which offers a variety of massages. Even with such a low nightly rate, reviews are very good with past guests phrasing the location, massages and customer service.